#1056 — A scenic picture taken of the big Mt. 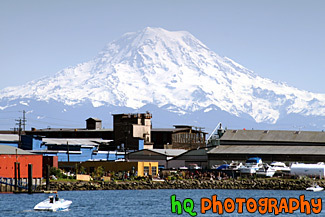 Rainier taken from the Puget Sound waters in Tacoma, Washington on a sunny day with blue skies. #1105 — A scenic picture taken of Mt. Rainier in the background and Commencement Bay of Tacoma, Washington in the foreground with boats seen in the water. 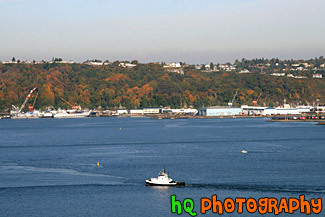 #1331 — A scenic picture taken of Commencement Bay in Tacoma, Washington with the trees changing color in the foreground due to the Fall season. #1333 — A scenic picture taken of the Commencement Bay sound located in Tacoma, Washington. This photo was taken during the autumn season as you can see from the changing colors of the trees in the background. #1045 — A scenic picture taken of the Tacoma, Washington Commencement Bay looking through some pretty trees down at some boats in the water. 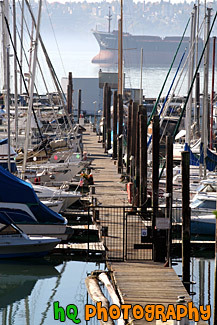 #1136 — A scenic picture taken close up of a dock and sailboats parked along side located in Commencement Bay in Tacoma, Washington. 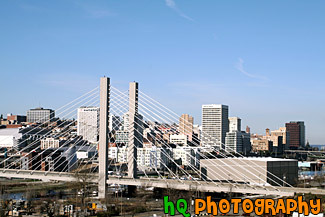 #932 — A scenic picture taken of downtown Tacoma, Washington on a beautiful sunny day with blue skies seen over the city. Tacoma serves as a gateway to some of the most magnificent natural wonders in the world such as Puget Sound, Mount Rainier National Park and the Olympic Peninsula. #1332 — A scenic picture taken of Mt. Rainier appearing like it is sitting on clouds with blue sky above. 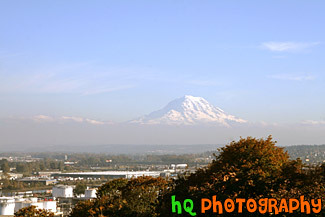 This picture was taken from Tacoma. 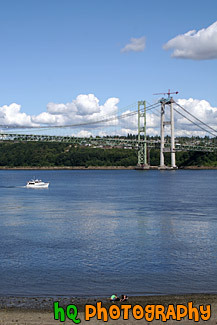 #1089 — A scenic picture taken of the "double" Narrows Bridge and a boat underneath. 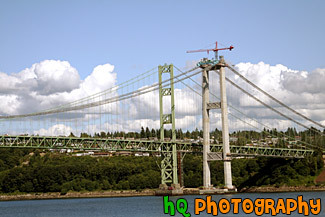 Being built next to the old Narrows Bridge built in 1950 is the new bridge which is nearly 80 percent complete. The new bridge opens to traffic in summer 2007, but renovations on the 1950 bridge go on for another 11 months after that. In summer 2008, when the new and existing bridges open in their final form, the 1950 span will take drivers westbound on two general purpose lanes and one carpool lane. The new bridge will carry eastbound traffic on two general purpose lanes, one carpool lane and a fourth "drop" lane. 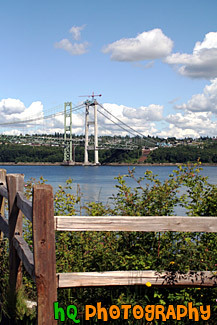 #1086 — A scenic picture taken of a wooden fence in the foreground of the "double" Narrows Bridge. Being built next to the old Narrows Bridge built in 1950 is the new bridge which is nearly 80 percent complete. The new bridge opens to traffic in summer 2007, but renovations on the 1950 bridge go on for another 11 months after that. In summer 2008, when the new and existing bridges open in their final form, the 1950 span will take drivers westbound on two general purpose lanes and one carpool lane. The new bridge will carry eastbound traffic on two general purpose lanes, one carpool lane and a fourth "drop" lane. #1087 — A scenic picture taken of the Narrows Bridge project in process as the new bridge is being built right beside the old bridge of 1950. The new bridge opens to traffic in summer 2007, but renovations on the 1950 bridge go on for another 11 months after that. In summer 2008, when the new and existing bridges open in their final form, the 1950 span will take drivers westbound on two general purpose lanes and one carpool lane. The new bridge will carry eastbound traffic on two general purpose lanes, one carpool lane and a fourth "drop" lane. 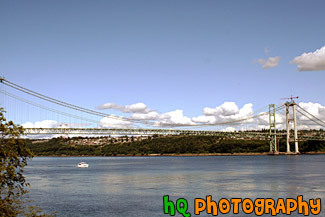 #1095 — A scenic picture taken of a close up of the "double" Narrows Bridge. 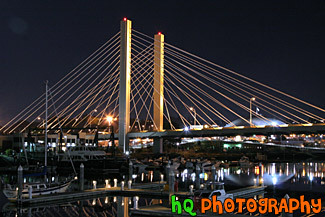 Being built next to the old Narrows Bridge built in 1950 is the new bridge which is nearly 80 percent complete. The new bridge opens to traffic in summer 2007, but renovations on the 1950 bridge go on for another 11 months after that. In summer 2008, when the new and existing bridges open in their final form, the 1950 span will take drivers westbound on two general purpose lanes and one carpool lane. The new bridge will carry eastbound traffic on two general purpose lanes, one carpool lane and a fourth "drop" lane. 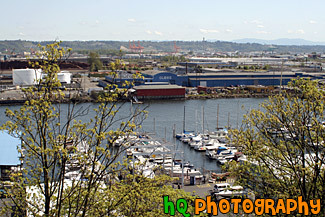 #1341 — A scenic picture taken of the Port of Tacoma in Washington State on a sunny day. Part of Commencement Bay is seen in the foreground. 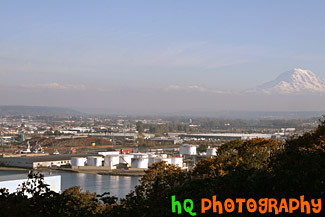 #1337 — A scenic view of the Port of Tacoma on a sunny day with Mt. Rainier seen in the background. 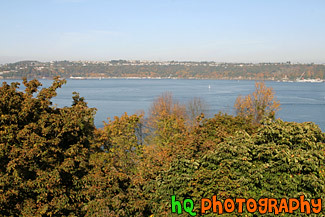 #1130 — A scenic picture taken of sailboats located in the Puget Sound of Commencement Bay in Tacoma, Washington on a beautiful sunny autumn day. 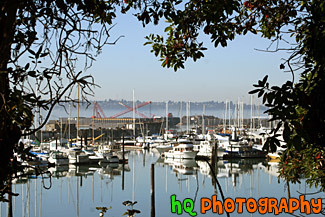 The sailboats are being framed by tree branches in this photo. #1746 — A scenic picture taken of downtown Tacoma, Washington at night with a bridge seen in the foreground and the Tacoma dome seen in the background. 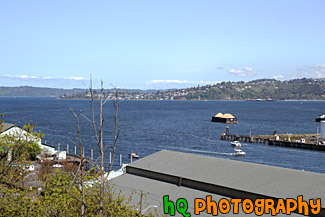 #1044 — A scenic picture taken looking out at Commencement Bay from downtown Tacoma, Washington. This picture is looking towards Brown's Point, Washington and was taken on a beautiful sunny day. 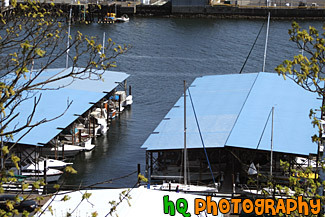 #1046 — A close up picture taken of boats under shelter located in Commencement Bay in Tacoma, Washington. 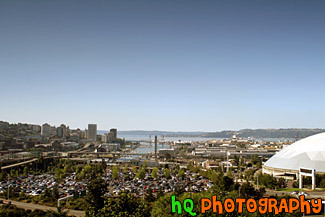 #1103 — A scenic view of Tacoma, Washington taken from a hill. 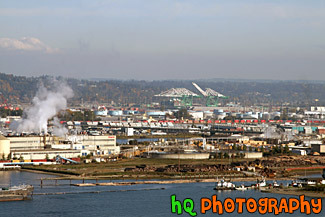 In this photo you can see part of the Tacoma Dome, the buildings of downtown Tacoma, and Commencement Bay. 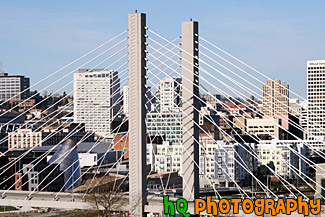 #933 — A close up scenic picture taken of downtown Tacoma and the scenic bridge where you can see the buildings of Tacoma through it. 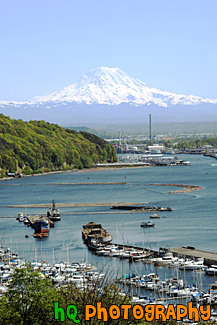 Tacoma, Washington, is located on the West Coast nestling between Commencement Bay and the Puget Sound. It is about 36 miles south of Seattle and 28 miles north of the capital of Washington, Olympia. Tacoma's historic and innovative downtown has expanded down the hillside to absorb and include its Puget Sound waterfront. With new condos, retail and the International Museum of Glass. Tacoma's Waterfront Downtown is reborn.